Tags: Dashboard control unit, Electronic injection, Engine compartment fuse carrier module, fuse block, fuse box, fuse layout, fuse map, fuse panel, Horn, radiator fan. Tags: Dashboard control unit, Electronic injection, fuse block, fuse box, fuse layout, fuse map, fuse panel, Horn, radiator fan. 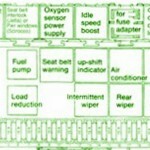 Tags: A/C compressor, Condenser Fan, fuse block, fuse box, fuse layout, fuse map, fuse panel, radiator fan. 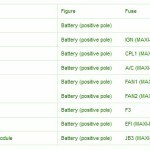 Tags: charging system, fuse block, fuse box, fuse layout, fuse map, fuse panel, headlight retractor switch, radiator fan.